7 But when he saw many Pharisees and Sadducees coming to watch him baptize, he denounced them. “You brood of snakes!” he exclaimed. “Who warned you to flee God’s coming wrath? 8 Prove by the way you live that you have repented of your sins and turned to God. 9 Don’t just say to each other, ‘We’re safe, for we are descendants of Abraham.’ That means nothing, for I tell you, God can create children of Abraham from these very stones. 10 Even now the ax of God’s judgment is poised, ready to sever the roots of the trees. Yes, every tree that does not produce good fruit will be chopped down and thrown into the fire. Two things stand out to me in this passage. First (and fitting our red letter focus), v.15 marks the first time Jesus speaks in Matthew’s Gospel, and the statement here tells a lot about how Matthew is going to approach his telling of the story: Jesus is the one who comes to carry out all that God requires. In doing so he both secures salvation for us and shows us what it looks like and what exactly it means to live life in such a manner. Jesus was not the only one who needed to carry out all that God requires. Each of us bears the same responsibility, though the specifics will look somewhat different for each of us. 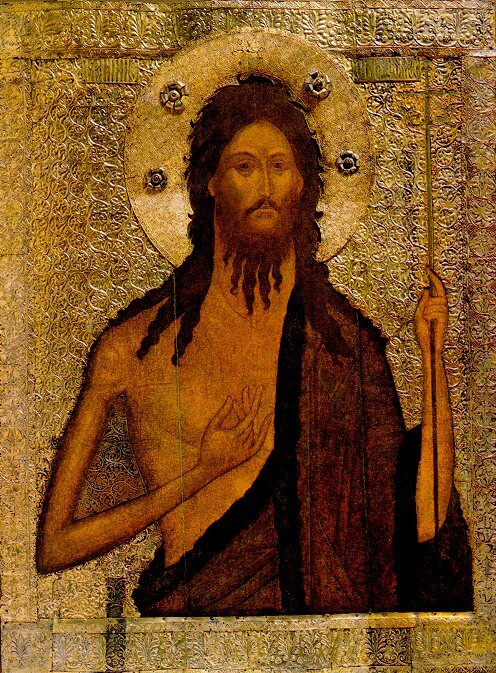 Speaking of looking different: John the Baptist. I didn’t mention this when we read Mark 1, though the two descriptions are nearly identical, and convey to us that John was outlandish in his dress, diet, and demeanor. Bear in mind that John was a prophet, he came in the spirit of Elijah, so these were not merely eccentric choices, they prophetic examples (Elijah, Jeremiah, and other prophets often did the same sort of things – demonstrating as well as speaking the message of God). The message here is one of non-participation in the prevailing economic system. John won’t eat the food or wear the clothes produced in such an oppressive economic climate, where both are the product of slave labor. Much like our own day. Where do our clothes come from? Where does our food come from? Do you suppose we can live off the suffering of others with no consequence? John didn’t think so. And I’m afraid he was right. If we ask honestly, we will find that what God requires of us involves ameliorating – not exacerbating – the suffering of others.